Many have requested our vertical Book of Mormon Genealogy Chart be made available in a horizontal format to allow the entire chart to be read at eye level on a wall. It shows all the people mentioned in the Book of Mormon and their family relationships to one another. 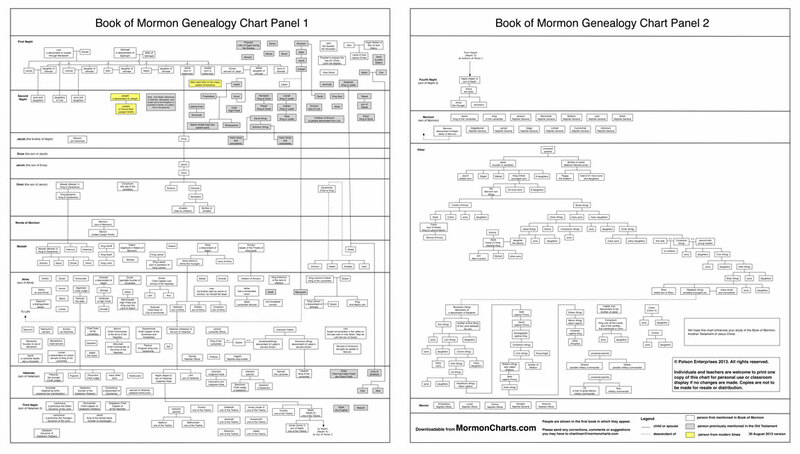 Our Horizontal Book of Mormon Genealogy Chart is now available. We also have a VERTICAL version of the chart primarily for use on electronic devices or for printing and folding up like a map. The HORIZONTAL version of our Book of Mormon Genealogy Chart prints as approximately 27.5 inches (tall) X 47.5 inches (wide). Here, Federal Express / Kinkos will typically print them in black and white for less than ten dollars. If you want to print a copy and agree to the terms below, just download a copy to a thumb drive and carry it to a copy place. Some copy services allow you to email them the file to be printed. Just be sure to ask for black and white. Color is much more expensive and not needed for the chart in its current state. We may one day release it in color, but not today. If the copy place refuses to print a single copy of a copyrighted poster, have them read the copyright block near the lower right hand corner of Panel 2 of the poster. The horizontal version is presented as two panels as seen above. If you do not have a wide enough area to display it, you can use a large paper cutter or scissors to cut the vertical strip between the panels and create two charts from it that might be easier for you to post on the wall. Cut a piece of cardboard out to be slightly larger than the chart. Tape the chart to the cardboard, then just sit it on something that places it at eye level, or poke a hole in it and hang it with a string. Have it laminated and thumbtack it to the wall. For more information about the chart, see our Behind the Scenes:Creation of the Book of Mormon Genealogy Chart post. If you are interested in the vertical version which tends to be better adapted to display on electronic devices, you can find it at VERTICAL version. If you spot any errors or have any suggestions, please comment below OR use the “Contact Us” tab in the top menu. Glad your daughter is reading the BOM. There are just far too many names for them to be legible on 8 1/2 X 11 paper, even when the create the two separate horizontal charts. You are not missing anything. However, you can take it to a copy shop and have them print off a full size copy (about 24 inches by 49 inches for the vertical version) probably for less than $10 in black and white. Then just fold it up like a road map, or tape it to a large sheet of cardboard and your daughter can use it like that. We provide some more details on that approach on the page covering our vertical version of the chart. It lends itself best to being printed and folded, or being printed and taped to a piece of cardboard for handheld viewing. If you want to put one on the wall, the horizontal version works best because more of the chart can be at eye level. Both versions have certain advantages when using them online depending upon exactly how you are using them. Thanks for taking the time to put this together, Now I can understand how the geneology is layed out, never have been able to figure this out, I’ve always been lost! Thanks, people like yourself always striving to make learning easier.